Putting a Chinese team together for an international tournament is no easy feat, but captain Ken Su has plenty of experience at it. He’s been the driving force behind CUUP (Open) at WUCC 2010, the Chinese national team (Mixed) in 2012, and this year’s incarnation of CUUP (Mixed). CUUP (China United Ultimate Party) draws players from Shanghai, Beijing, Ningbo, Wuhan, Toronto, New York City, Phoenix, and Victoria, Canada. It includes players ranging in age from 14 to 39, many of whom are attending their first international tournament. 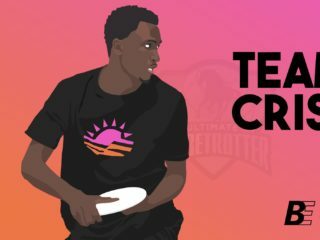 While ultimate, especially youth ultimate, is experiencing strong growth in China, there are still barriers to putting together teams, especially teams for international tournaments. Xue “Sei” Zhixing, a Ningbo-based player, explains that “it’s hard for many people to get time off work, and it is very expensive for us to travel. 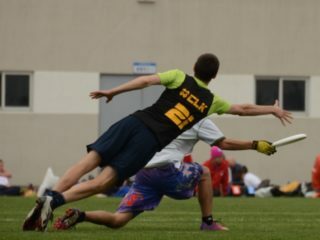 Also, getting a visa is an issue for many people.” There is one other factor that hinders competitive ultimate in China: culture. “When people get married, you never see them playing again,” says Sei. “You are expected to focus on work and starting a family. For a lot of parents, a couple hoping to have a baby shouldn’t be playing sport.” When Sei tore his ACL at the Shanghai Open in 2008, aged 25, his parents insisted he hang up his cleats. “If your parents told you that in Canada, you’d never listen,” chimes in Ken, who was raised by Chinese-born parents in British Colombia, Canada. “But in China, you have to.” Sei used his rehab year to build his ultimate-focussed company, Ultipro. Ultipro worked on refining their 175g disc (approved this year by WFDF) and breaking into the international market for ultimate uniforms and compression clothing. 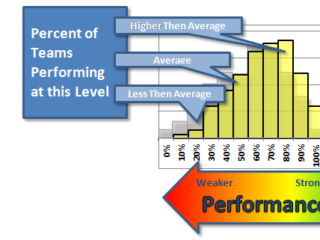 In fact, Ultipro became so successful that Sei and other founders have quit their “regular jobs” to focus on entirely on Ultipro – another move that horrified their parents. Along the way, however, Sei convinced his to let him rejoin his friends on the field. Ken (who now lives in Beijing), Jenny, and Sei are a few of the CUUP players who both live in China and are of Chinese decent. However, like many teams in their country, a large percentage of the players are expats who have come to live in China to work, and brought their love of the sport with them. The dispersed nature of the team – some expats playing with CUUP at WUCC 2014 are currently back living in North America – means that a cohesive training program in the lead-up to WUCC wasn’t possible. The team was able to have one practice together thanks to cancellation of games on the first day due to rain. What they lack in preparation, CUUP makes up for with passion and determination. Ken explains that CUUP is absolutely dedicated to representing China on the world stage through spirited and determined play, regardless of the score. He is also excited about the exposure that this tournament gives up-and-coming Chinese players, and what they’ll be able to bring back to their teams at home. Ken, Jenny, and Sei’s passion for the game is infectious. Between them, they’ve played in 10 countries, on over a dozen different teams, and their ages span 25 years. They would have spoken about ultimate in China for an entire afternoon, given the chance, and there is no doubt that they will be of even more value to their respective teams when they return home from Italy after WUCC 2014. Through a volunteering project at her bilingual school in Shanghai, Jenny will be traveling to a village in rural China to teach ultimate this December. 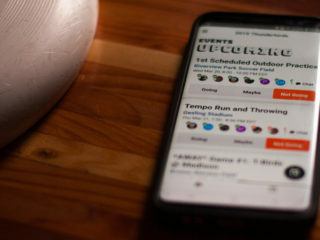 CUUP mostly communicates in Mandarin, although there are some translations to English, and some players’ first language is Cantonese. 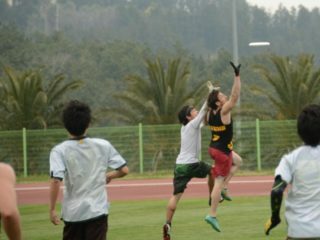 Over 100 schools in China have been introduced to ultimate, and 11 schools participated the Junior division of the Shanghai Open in 2014 (up from 3 in 2013).